Sarah graduated from the Royal Veterinary College in 2013. She joined Boness Vets in the same year and is now part of our Senior Management Team. 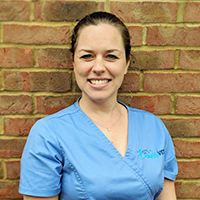 Sarah has a particular interest in surgery and most enjoys laparoscopic procedures. She is excited by a fully booked ops list but is just as happy with the demands of a busy out-of-hours emergency shift. Whilst Sarah has a lot of respect for our feline friends she really enjoys working with our canine patients. Sarah has a pet squirrel called Harry. He lives in the lounge and watches television! She also has three ducks called Weasley, Percy and William. She’s had Weasley since she was a day old and she enjoys many an evening watching TV in the lounge (with Harry!). Sarah also has a rescue Rottweiler called Mini who lives with her mum but regularly goes on walking holidays with her. Outside of work Sarah enjoys horse riding, walking the dog, playing with the ducks and helping out on the farm with the beef cattle and sheep.